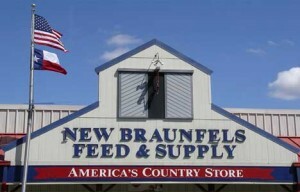 For more than 25 years, New Braunfels Feed & Supply has been THE place to shop for all your feed and supply needs. Today it remains the top feed store to visit and shop. Our family owned and operated business is proud to serve the New Braunfels community. Over the years we have expanded our products and services to include small pets and exotic birds. We carry a full lineup for supplies, feed, toys and treats that make ownership of a small domestic pet or bird a joy to own. Our extensive inventory of items ranges from small to large including lawn & garden products, gift & home decor items, equine supplies, and poultry supplies. We work with a large number of well-known and respected suppliers from Purina to Valhoma. We are proud to be a Stihl Distributor. New Braunfels Feed & Supply is proud to be a Purina Dealer. For more than 100 years Purina Mills has been the leader in animal science and nutrition. As a “Purina Certified Expert Dealer“, New Braunfels Feed & Supply offers a complete line of quality Purina feed products, has knowledgeable and trained associates and are a one-stop-shop for all your customers’ animal needs. 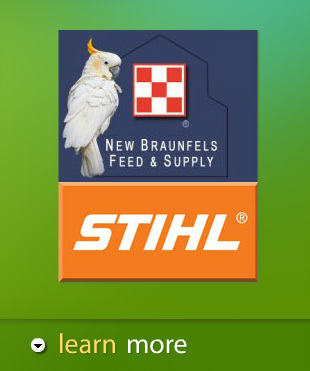 We invite you to browse our site to see all of the products and services you can find all in one place — New Braunfels Feed & Supply, Inc. located in the lovely river town of New Braunfels, Texas. Find out the difference between Hybrid vs. GMO vs. Heirloom plants. Chicks 6 weeks old need special care. See how to care for them at this age.